Shark Diving Oahu. These tours are unique in all of Hawaii. We offer many at discount pricing. Shark diving tours from a cage in Oahu seem almost out of place. Does it in any way seem normal that you would swim with sharks in Oahu? Jumping into a shark cage and watching dozens of sharks as large and larger than 15 feet in length swarm around you in the open ocean seems like something you might only find on the adventure channel on "This Week Is Oahu Shark Cage Week". Yet thousands of people just like you have had this experience and have returned home to tell about it. And......talk about their shark experience they do, almost non-stop probably for days after the event because it had such a major impact upon them. So how is it possible that something you think is so dangerous that you would only see on television or in some action motion picture actually be so mainstream as to become popular with the general public? How is it that hundreds and thousands of people have participated in these shark tours over the course of the years these shark tours have been available? The answer quite simply is that these Oahu shark cage tours may not be as dangerous as you think. Everyone is hesitant to swim with the sharks on Oahu at first. Join the crowd. Most people know that lots of others have done this before but really, how secure could it be to be in a cage that close to huge sharks. The answer is surprising. Most people are very contented with the tour once they become involved in the process. Shark Diving Oahu. How Does it Work. What is the Process? You will meet the Shark Boat at Haleiwa Harbor on the north shore of Oahu. It is about an hour's drive from Waikiki so you might have to get fairly early if you want an early morning tour. The boat will generally take about 12 people or so and you will motor out into the ocean a bit over three miles. Suddenly you will come to a stop and the captain and crew will release a shark cage perched on the back of the boat which is about 7'x5'x9' and it will float on the surface of the ocean behind the vessel. The top is open but the sides and bottom are all bars like in a jail cell. As you stand with your feet on the bottom of the cage with your head still above water you can then don a face mask and snorkel and lower your head into the water so you can see the underwater activity outside of the cage. The area around the boat is chummed with sliced fish and within minutes sharks will arrive in droves. There may be twenty sharks in all on the day you participate and many of them will be over 10 feet in length and many even larger. They will swim around the cage, often very close. Most people will perceive them to be fairly docile as they glide from all angles skimming the bars. The cage will hold only two people at a time so you will actually only be submerged and observing the sharks for a period of 15 minutes or so, but in retrospect it will seem much longer. 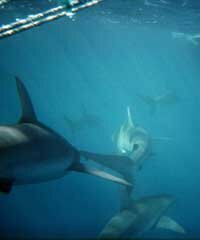 The sharks you will see on a given day will likely be Galapagos Sharks although other types of sharks can and do show up. After you get out of the cage and onto the boat the cage will be replaced with two more adventurers and this process will continue until all have had an opportunity to view the sharks. Each person upon returning to the boat is likely to be 'wide eyed' and filled with an adrenaline high that will last all the way into the harbor and likely also continue throughout the day. With your experience complete, you will have a much different viewpoint regarding the sharks that swim in our oceans than you did a couple of hours before. Now for the next level. Swim with the sharks on Oahu, without a shark cage! As much as it might seem that we have now entered the twilight zone, this tour actually exists. And it is very popular. For all intents and purposes it is almost identical in format to the cage tours but (you guessed it) you swim with the sharks without a cage. This is definitely not a tour for everybody, but for many people (and you know who you are), this is for you! 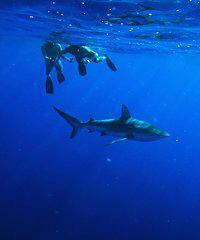 Do you still have questions about Shark Diving Tours? What is the best time to go on an Oahu Shark Cage Diving Tour? 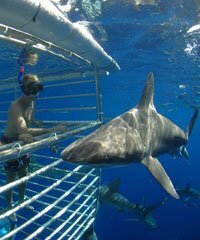 So don't freak out on me here people, but we have some fantastic shark cage tours that happen here on Oahu. In fact, Oahu is the only one of the Hawaiian Islands that we actually have this fantastic tour available to you. It is perhaps a little scarier than ... looks a little scarier than it actually is. It's probably not a tour for everyone but it is one of the most popular, and certainly exciting, tours that we have anywhere on all of the islands. This is a tour, when you finish this tour, you cannot stop talking about it. In fact, everyone you meet will hear about this tour. That will probably happen for a couple days. So prepare yourself for it. It's just one of those things ... just the way it happens. Let me show you a map. This occurs up here off the coast of Haleiwa, up in the north shore. So most of you are down here and you're going to need to get up there. There is some transportation that can happen in terms of the tour itself, where you can be charged additional to be picked up and taken up there. It's fairly expensive. If you've got your own car, that's the best way. They leave from here, we have a couple great companies that do this. They start in the morning, early. Seven, eight o'clock, nine o'clock, ten o'clock. Kind of go up until it gets like wind blown or maybe early afternoon, something like that. Here's what happens. Here's the way it works. You're at Haleiwa Harbor. You get on a boat. It seems gentle enough at that point. It's the size boat that maybe carries maybe ten passengers, something like that. You cruise out of the harbor and you're heading in a direction about three miles off shore. Now the unusual thing about this boat is that kind of on a platform in the back, it's got a cage. Cage maybe this high, something like that. I honestly don't know the dimensions but maybe six feet by six feet, something like that. It's got cage mesh on the bottom and on all four sides. Nothing on the top. So the way this works is you'll cruise out there, you'll get to a place where sharks are. They'll usually chum the water to bring more sharks in. The type of sharks you have are generally the Galapagos Sharks. They are immense and there are many. So the times I've been out there, see maybe at least 10 sharks. I'm going to say many more. Six, seven, eight, nine, ten feet, something like that. They all come to feed and they're all surrounding the boat that you're on. Well the cage, which has been on a platform kind of behind the boat, is then pushed over and released into the ocean and it floats there. You take maybe a couple people, maybe three, and they will jump off the boat into the cage. They'll be given Snorkeling gear and a mask and snorkel. They'll just be inside the cage. Then they kind of release the cage somewhat, and it goes back behind the boat, maybe 20, 25 feet. Still attached to the boat by a chain or whatever. At that point you are in the cage and you've got your snorkel and your mask on and snorkel, if you chose to have it. The water in the cage maybe you have to go down under the surface of the water. Just a little bit like you're Snorkeling. Then you can see the sharks as they come all around your cage, getting very, very close. Closer than you can imagine that would have ever been next to a shark. You just get the whole notion of the immensity of it and you see the eye as it passes right by. I mean you're literally inches, in many cases, away. People have a tendency not to hold on to the bars like this but it's more like this, so you don't have your fingers outside. They just cruise around and you're just kind of amazed by the fact that these large animals are so close to you and you're there in this cage watching them. In any event, this happens for maybe 15 minutes, something like that. Then you're reeled back into the boat and you get back up on shore and then next two or three people go back into the cage and then they have that opportunity. It really is a sight to behold. Your heart just pounds, even on the boat just looking down, you're able to see the fins going by all around. But to be actually in the cage, and to see them from that perspective, is really amazing. These are fairly short tours, maybe a couple hours in totality, from the time you leave the harbor and then get back to the harbor. But you've had quite an experience during that period of time. So this is something that is very popular. It's something that you either definitely want to do, have to do or there's no way in the world you'll do it. There are enough people that really want to do it that it can get very, very busy. We can sell out very easily and so it's a decision you want to make probably before you come to Hawaii. Do I want to do that? Do I really want to do it? Am I going to be on Oahu and is that an experience that I want to have? If you decide "yes" on that, that's something you probably want to book before you get here, so we can get you on the correct time and the correct day, so that you're not going to be disappointed. So if you have any questions about Tours or about Activities in Hawaii, just give us a call or check out TomBarefoot.com. We're here to help.